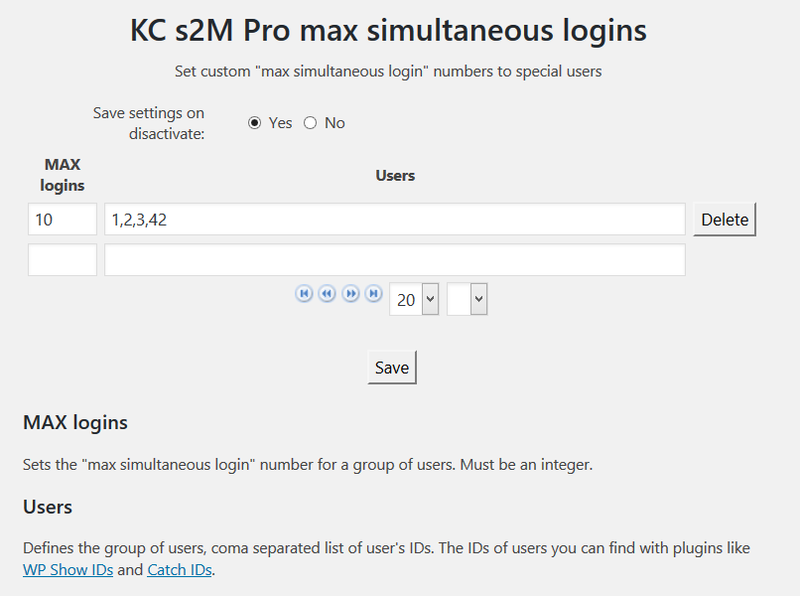 Want to have different "max simultaneous login" restrictions to special (exactly) users with s2Member® Pro? This is the best tool for you to do that. The s2Member® plugin, Pro version, allows you to set "max simultaneous login" number, to improve security of your site. That's great, but this rule is applied site wide. And there is cases, where you need to allow different "max simultaneous logins" to some user. Like, if you want to allow access to a class of 20 kids. This will means to ask them to create his own accounts, and to login as usual users, as there is restrictions "max 3 simultaneous logins". But with this plugin you create one account, set this "mutli-user" account to max 20 logins, and give it to kids. No way to get complaints from them about lost passwords, forgotten accounts, ...(add all other excuses here). And most important - will not hold kid's emails on the site. You need to set number of "max logins" restriction, and the users (as come separated list) who will use it. Sure, you can set several "max login" "levels", and can add as many users as you need. Note, that plugin will not check if you type user's ID right, if you double IDs (on same or different rows), and even if such user exists - you must be careful. This entry was posted in WordPress plugins, WP+s2M plugins. Bookmark the permalink.